Most new users to A/B testing struggle to find which tools to use, how to set up their first A/B test, and how to know when the test is done or to see the results. In this blog post, I’ll show you a free tool, readily available to every website owner using Google Analytics. I’ll also give you some direction on setting up your first A/B test. Imagine you’ve set up an A/B test to choose the best page design for increasing your subscription rate, or try a few homepage variations to see which do the best job at directing new visitors to your best-selling products. 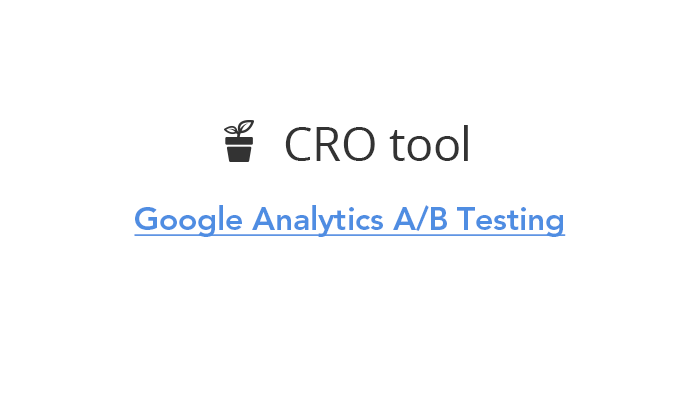 It’s very simple to use Google Analytics for A/B testing. Now, I’m going to provide you with a step-by-step guide for easily testing your web page through a Google Analytics content experiment. Google has combined A/B testing and split testing into one term called Content Experiment. 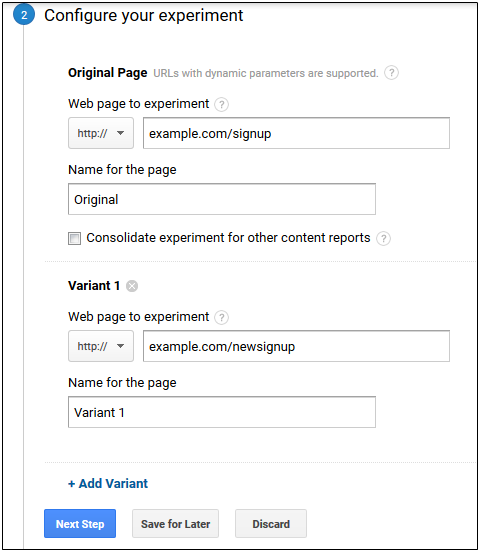 Log in to your Google Analytics account; under Behavior you will find Experiments. On that page, click the button for Create Experiment as shown below. 1) Give a meaningful experiment name. For instance, if you want to perform A/B testing for a newsletter subscription, then create an expressive name that makes it easy to identify the experiment. 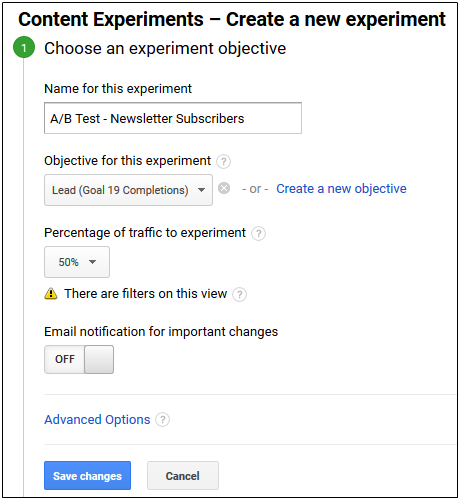 2) Underneath ‘Objective for this experiment’, select the metric you’ll use to gauge the results from your A/B test. Metrics can be chosen from Ecommerce, Goals, Site Usage, etc. To boost revenue or the number of transactions, select eCommerce. If you have predefined goals like session duration, event leads, or destination page clicks, then opt for the goal metric. Lastly, if you’re looking to improve user experience through average page views or time on site, select site usage. 3) Once an objective is set up, you can divide the percentage of web traffic for the content experiment. This will split the users visiting your website; 50% of users will see one of your test pages as opposed to your original page. You can change the percentage to one suiting your requirement. 1) The next step is to configure the experiment by adding in your original web page and your new test pages. 2) As you can see in the screenshot below, you just need to enter the URL of your current page and all variation web pages. 3) Once you add the original and test pages, look over the preview image to be sure you’ve entered the correct URL. Click the Save Changes button. 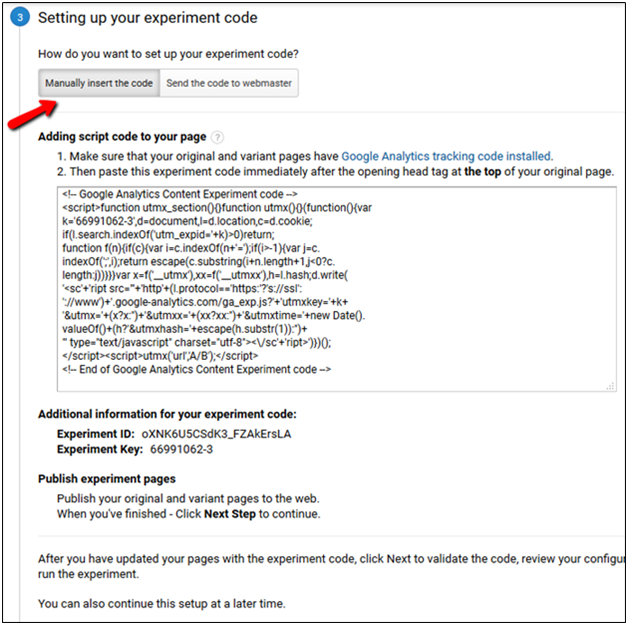 Now, you’ll need the experiment code for your A/B test project. Place this code immediately after the opening head tag at the top of your original web page. Once it’s added, click the Save Changes button to progress to the last step. 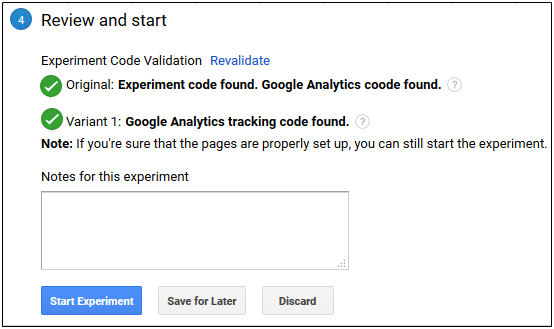 After you’ve added the code, Google Analytics will confirm it and show any errors that have been identified, if applicable. Sometimes Google Analytics isn’t able to evaluate the code. In this case, you can skip the validation step as long as you’re confident the code was properly added. Instead, check your page for any errors that may have been encountered. Otherwise, you’ll be given the green light to start your content experiment. Your experiment will launch and you’ll start seeing reported data within one to two days. When your experiment has run its course, Google Analytics will evaluate the result and declare the winner based on your previously defined metrics and threshold. It will take at least couple of weeks to reach this step. Websites need iteration; including continuous analysis, new ideas, and changes to constantly increase conversion rate. By reviewing your results, you’ll identify the page that performs the best. You can then publish this as the page you want viewed by all website visitors.